In what turned out to be a horrible trade, the Boston Red Sox sent pitcher Aaron Sele to the Texas Rangers in November of 1997 in exchange for outfielder Damon Buford and today’s Beantown Baseball Birthday celebrant. Sele was a former Boston first round draft choice who had just won a career-high 13 games for the Red Sox the previous season. During the next four seasons he would evolve into one of the ALs most effective starters, winning 69 games during that span. Buford would end up spending two unspectacular seasons as Boston’s fourth outfielder. Leyritz, who was best known for his days with the Yankees, would only remain a Red Sox for half a season, getting traded to the Padres at the 1998 inter-league trading deadline for three nondescript minor leaguers. While he was with Boston, Leyritz did not do too badly at the plate. He averaged .287, hit 8 home runs and drove in a couple dozen. But he was a liability defensively and since Boston already had Reggie Jefferson, Mike Stanley and Midre Cummings all DHing, Leyritz got the ticket to San Diego. I’m pretty certain the Red Sox coaching staff and his Boston teammates didn’t miss him. One thing became pretty clear to me as I researched Jim Leyritz for this post. It sounded like he was considered to be a pretty big jerk by most of the guys who managed him during his days in the Yankee organization and also by quite a few of his Yankee teammates. Bucky Dent couldn’t stand him and evidently Buck Showalter felt that way too. Joe Torre tolerated him but heck, Leyritz’s game-tying home run off of Atlanta’s Mark Wohlers in Game 4 of the 1996 World Series just may have saved Torre’s job. Don Mattingly nicknamed Leyritz “the King” because he was always telling everyone else how great he was. Actually, I sort of already knew that Leyritz was somewhat of a jerk before doing research for today’s post. My son’s good friend was related to a girl who once dated Jimmy boy. My son’s friend attended a family dinner to which Leyritz had also been invited. She told us that she had never met a more conceited human being in her entire life. 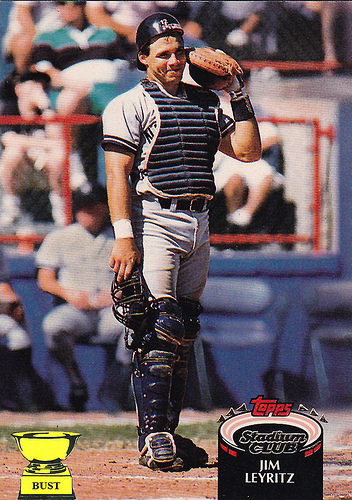 In any event, after spending the rest of 1998 and the first half of ’99 with the Padres, Leyritz returned to New York for parts of two seasons before finishing his big league playing career with the Dodgers, in 2000. The native of Lakewood, OH has since had tremendous problems trying to survive outside of baseball. The most infamous incident was the tragic accident he had the day after his 44th birthday in 2007 in the state of Florida. Leyritz was driving drunk when his car collided with one being driven by a young female who, as it turned out, was also driving while intoxicated. Authorities arrested the ex-Yankee, charging him with vehicular manslaughter. The case finally came to trial in November of 2010 and Leyritz was acquitted of the manslaughter charge. He later settled a lawsuit brought on him by the dead girl’s family, out-of-court. Shortly after the first draft of this blog post appeared, a friend of Leyritz’s e-mailed me to present a different and more updated perspective of the former Yankee. According to him, Leyritz has been dating his sister for a while and has always treated her and her children great. The e-mailer also assured me that Leyritz is a “great” Dad to his own kids and good friends with his ex Yankee teammates, including both David Cone and Bernie Williams.